Willow Springs Learning Center four-year-old kindergartners and their families contributed generously to Sussex Outreach Services (SOS) this holiday season. Families and staff collected more than 300 gifts, and students hand-delivered them as a group to St. James Catholic Church where they sang songs before returning to school. In addition, Willow Springs staff members made a financial donation. The toys and gifts will be distributed within the local community. Lannon Elementary School students, families and staff members collected 265 food items and paper products, 227 new items of clothing and toys and 239 gently used toys and clothing – all donated to the SOS food pantry. New clothing items included 80 pairs of socks, 13 pairs of underwear, 50 pairs of mittens, 55 hats, three pairs of boots, three blankets, eight tops and bottoms, and 15 new toys. Lannon staff sponsored a Sussex area family of four for Christmas and generously donated toys, books, bedding, coats, grocery gift cards and several household items to help them this holiday season. Students decorated 328 paper grocery bags donated by Sussex Piggly Wiggly to be used at the Sussex Food Pantry Christmas dinner distribution. 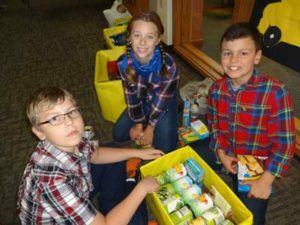 Maple Avenue fifth grade students, through their Uniting Kids and Community (UKC) program, sponsored a food drive. 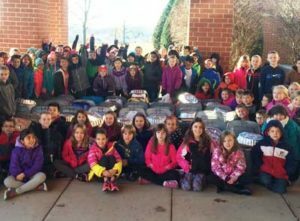 Maple Avenue students collected more than 300 non-perishable healthy foods and snacks to be donated to the Sussex Food Pantry. Maple Avenue buddy classes in first and third grades earned money by doing extra work at home. 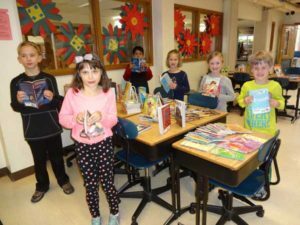 They raised $500 to purchase 125 books for all ages and reading levels that families could enjoy during the holiday season. All books were donated to SOS. Maple Avenue kindergarten students in Mary Kuriga’s class performed random acts of kindness in December including decorating school hallways and the principal’s office, delivering candy canes and leaving holiday bookmarks in library books among others. Marcy students collected more than $2,500 for the Stars and Stripes Honor Flight which will fund flights for five veterans. Kindergarten classes donated more than 600 items to the Sussex Food Pantry. The items were collected as a part of a holiday food drive. First grade students participated in “Red Nose Day” raising money to help fight children’s poverty in America and across the world. Second grade classes collected items for the Humane Society and the Ronald McDonald House. Third grade classes are planning a later donation the Ronald McDonald House. Fourth grade classes donated candy and wrote cards to kids at Children’s Hospital. The classes also wrote letters to soldiers. Fifth grade classes participated in a book and backpack drive for a Waukesha school. With the help of a third grade parent and the Back the Blue organization, technology class students created 640 beautiful thank you and holiday cards to spread cheer to local law enforcement officers and to thank them for all they do to keep our community safe. Kindergartners in Peter Dargatz’s class collected “Dargatz Dollars” for classroom tasks in their “wants and needs” unit. Dollars are turned in for items the students wanted and donated to patients in need at Children’s Hospital of Wisconsin. Students and families also signed a giving contract and gave up one holiday want to donate to those in need. The kindergartners will be leading an all-school Children’s Hospital fundraiser in January. Kindergarten classes delivered gifts for 75 residents at Serenity Village, an assisted living residence in Slinger. As part of the Kindergarten Service Project, students and their families signed up to provide gifts for individuals at the facility. The gifts were distributed at the residents’ holiday party. Woodside first grade and third grade families brought donations for the Sussex Food Pantry to their holiday music performances. The fifth grade Students of Service Club made and sold ornaments, fun-shaped crayons and buttons to raise money for the Juvenile Diabetes Research Foundation (JDRF). They made $110 which will be presented to JDRF at the end of December. Woodside families and staff members collected more than $2,000 before Thanksgiving to create turkey tubs filled with groceries for families in need in Milwaukee’s Notre Dame Middle School community. Woodside students were asked to donate money they earned by doing chores at home. Parent volunteers shopped for groceries to build the tubs. Items included a frozen turkey, bag of stuffing, jar of gravy, sweet potatoes, fresh vegetables, bread, canned cranberries, a fresh pie, beverages, appetizers such as crackers and nuts, along with an aluminum roasting pan. All of the items were put into 31 large sturdy tubs and delivered to families. Templeton employees donated money to be able to wear jeans to school Dec.16. A total of $153 was raised for the Sussex Food Pantry. Student Council collected pajamas for the Great Bedtime Story Pajama Drive through Scholastic Reading Program. Scholastic will pair the 141 pairs of pajamas collected with a book to give to children in need. Spanish Club adopted two Hispanic families with six children total through the Christmas Clearing Council of Waukesha County. Students in all Spanish classes donated money to purchase gifts for the families including winter jackets, clothing, toys, books and gift cards. Spanish Club members wrapped the gifts and the officers delivered them to the families. Hamilton Cantabile and Concert Choirs spread cheer by caroling at the Best Buddies Holiday Cookie Party, the Power Test Company tree-lighting ceremony, Milwaukee’s Third Ward tree-lighting ceremony and Hamilton Education Foundation Charger Challenge: Holiday Edition. German Club St. Martin’s Day Clothing Drive: To help people who are less fortunate and in the spirit of the German St. Martin’s Day tradition, the Hamilton German Club collected 275 articles of clothing, jackets and shoes. Items were donated to Red Door Clothes to be distributed to Waukesha families in need. German Club also hosted a clubwide coin drive. A total of $350 was collected and used to sponsor five children through Christmas Clearing Council of Waukesha County. German Club members shopped, wrapped and delivered gifts to the families. Gifts included snow pants, gloves, hats, socks, clothes and toys. Club Action raised funds at its annual Rock Fest held at Sussex Bowl to benefit a Templeton Middle School teacher battling cancer and Kiva.org which connects people in poverty with charitable lenders to sustain small business ventures. Students also visited Growing Power and, in doing so, helped support its mission. Club Action continued its school supply collection to benefit Hope Center of Waukesha. Club members also sold apple cider at Charger Challenge with all proceeds going to the event’s toy drive which benefited SOS. Hamilton School Student Council adopted two children through the Christmas Clearing Council of Waukesha County. Student Council members joined together to shop and wrap the gifts. Student Council also completed a Spirit of Giving initiative in the school and the community. Students from all four grade levels were randomly selected to receive a $10 gift card and members distributed holiday cards that contained a gift card to members of the community. Hamilton DECA members shopped for holiday presents for the first grade class at Gaenslen Elementary School in Milwaukee. First-graders at Gaenslen completed “All About Me” forms and Hamilton DECA members provided gift bags with at least one nice toy and other inexpensive gifts to these students. Gaenslen Elementary is located in a Milwaukee neighborhood that has one of the lowest household incomes in the state. Several of the first grade students are homeless. In addition to delivering presents, Hamilton DECA took cookies and juice. Hamilton students spent the afternoon of December 14 reading books, putting together new toys and playing with the children for whom they shopped. This has become an annual event for Hamilton DECA and is always a heart-warming experience for the students who participate. The advisor and 33 students made the trip. National Honor Society (NHS) held a community blood drive serving the Blood Center of Wisconsin. More 90 people donated — enough to save 268 lives. Members also hosted food drives to benefit SOS the week before Thanksgiving, producing more than 3,000 pounds of food and $2,079 in donations. NHS sponsored two families and six children through the Christmas Clearing Council of Waukesha County and donated 58 gifts collectively. NHS members assisted at the YMCA Breakfast with Santa and Hamilton Education Foundation Charger Challenge: Holiday Edition. Charger Robotics Team 537 holds monthly drives for nonperishable food and personal care items to support SOS. This fall the team helped SOS move into its new facility at the Sussex Civic Center. Offices A, B, C, and Publications – High school staff members adopted one family providing them with many items to brighten their holidays including wrapped gifts of toys, games, clothing, personal items, household goods and gift cards. Staff members throughout the district adopted families in lieu of exchanging gifts with one another. They provided wrapped gifts of toys, games, clothing, food, personal items, household goods and gift certificates for numerous families in need of support.